Judy SullivanYears ago, when women’s coffees and prayer clubs were popular, true intercessors were rare. I am thankful that prayer and intercession have more relevance today, and Christian leaders on all the mountains of influence are beginning to understand the significance of their role. But even more important is the impact that can be felt when true intercession takes place that can safeguard a city, and change the course of history in a nation. 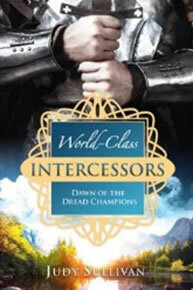 Who are the World Class Intercessors? I do not think the world has seen the likes of these dread champions yet. They are the ones called to prepare the way for the Lord’s return, the violent ones spoken of in Matthew 11:12 who are being raised up to take the kingdom by force. The Lord is calling His champions to the front lines of the battle to prepare the way for His return. The Lord gave me a word concerning this new breed of intercessor that you will read about in my book. We are living in serious times. The world has need of fearless intercessors who will stand in the gap and declare the words the Lord is releasing in these dark days. It is a noble call, and if you are an intercessor I pray you will hear and respond.